President Obama was barely in office a day before the THE ST. PETERSBURG TIMES' fact-check Web site posted "The Obameter: Tracking Barack Obama's Campaign Promises." Expectations are high for the new president  especially in progressive circles. Bill Moyers sat down with political columnist and blogger David Sirota and WALL STREET JOURNAL columnist Thomas Frank to talk about their expectations for this administration and what they think Obama must accomplish to bring real "change" to Washington. Sirota and Frank are both happy with the change in administration in Washington. On his blog on inaguraution eve David Sirota wrote  in large type  "Late-Night Re-Realization of the Wonderful...Just a quick, late night re-realization of something downright wonderful: An African American named Barack Hussein Obama is the President of the United States." But Sirota is not necessarily sanguine, as he remarked to Bill Moyers: "I'd like to hope. That's Obama's big word, 'hope.' The question is are we going to get change? We certainly have hope. But the question is whether all of the moves he's made suggest real change. We don't know." Centrism is something of a cult here in Washington, D.C., and a more specious superstition you never saw. Its adherents pretend to worship at the altar of the great American middle, but in fact they stick closely to a very particular view of events regardless of what the public says it wants. President-elect Obama can learn something from Mr. DeLay's confession: Centrism is a chump's game. Democrats have massive majorities these days not because they waffle hither and yon but because their historic principles have been vindicated by events. This is their moment. Let the other side do the triangulating. David Sirota, on his part, has expressed worry that the Obama administration will become too insular in dealing with the many crises facing the nation  taking a "czarist" approach as he explained in a January 19th article in the SAN FRANCISO EXAMINER. [Czarism] explains why when Obama aides this week demanded complete control over the second half of the Wall Street bailout funds, House Financial Services Committee chairman Rep. Barney Frank, D- Mass., shirked his oversight duties and said he's "willing to accept their word" that they will spend the money responsibly. In czarism, that's what legislators do: "accept the word" of the czar. Both commentators will be watching the administration closely. Says Frank, "I would use the term 'tough love' to describe the stance that we have to take." What has the President accomplished in just a few days? Check our list and then tell us how long you're willing to wait for change and what change means to you on The Moyers Blog. David Sirota is a political journalist, nationally syndicated weekly newspaper columnist and bestselling author living in Denver, Colorado. As one of the only national columnists living and reporting outside of Washington, D.C., he is widely known for his coverage of political corruption, globalization and working-class economic issues often ignored by both of America's political parties. He blogs at OpenLeft.com. Sirota's two books (HOSTILE TAKEOVER and THE UPRISING) were both NEW YORK TIMES bestsellers. Sirota is a senior editor at IN THESE TIMES magazine; contributes regularly to THE NATION, the AMERICAN PROSPECT and the HUFFINGTON POST; is the full-time blogger at www.credoaction.com; and publishes a newsletter at www.davidsirota.com that is e-mailed to thousands of subscribers each day. He serves as a co-chair of the Progressive States Network, a nonpartisan 501(c)3 organization that provides legislative analysis to state lawmakers. He is also a senior fellow at the Campaign for America's Future, a non-profit research and advocacy organization. Thomas Frank was born and raised in Kansas City. He graduated from Shawnee Mission East High School in Prairie Village, Kansas (1983), and from the University of Virginia (1987). He founded THE BAFFLER magazine in 1988, and he edits it to this day. He has a PhD in American History (U. of Chicago 1994) and is the author of three books having to do with the cultural inversions of our times: THE CONQUEST OF COOL (1997), about the advertising industry; ONE MARKET UNDER GOD (2000) about the myths of the NEW ECONOMY; AND WHAT'S THE MATTER WITH KANSAS? (2004) about the red-state mindset. His book about conservative governance, THE WRECKING CREW, was published in 2008. >Read a web-exclusive conversation between Bill Moyers and Thomas Frank about corruption in Washington. You can connect to David Sirota's many projects, online and off at his Web site. In addition to blogging on several sites, he writes a weekly free newsletter. You can subscribe online. Thomas Frank's Web site contains material from his books, journalism and multimedia interviews. Thomas Frank's column in THE WALL STREET JOURNAL. Political columnist and blogger David Sirota and WALL STREET JOURNAL columnist Thomas Frank talk with Bill Moyers about their hopes and expectations of this administration. Bill Moyers sits down with Columbia law professor and Nation columnist Patricia Williams and Princeton politics and African American studies professor Melissa Harris-Lacewell about the significance of this milestone and what it means for the future. 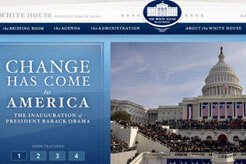 President Barack Obama quickly enacted changes with far reaching implications in his first few days in office. Find out what they are. Tips on how to get started volunteering in your locale. Take part in our web-only project.